A treasure trove of spices and flavors that helps create a wealth of culinary experiences. Khazana is a contemporary rendition of the traditional Indian dining experience. Our goal at Khazana is to enhance the dining experience of families and young professionals and showcase the Indian dining experience to tourists and expats in a luxurious ambience with private dining rooms, and interactive tables. nullThe cuisine is chef-inspired, Indian food, in the smart casual dining environment. Indian Cuisine which is the focal point is paired with and thereby enhanced by a comprehensive list of beverages and spirits such as cognacs, single malts and wines. The focus of this brand is on enhanced hospitality and operational excellence. 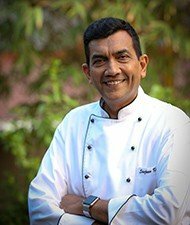 Sanjeev Kapoor’s Khazana at Al Nasr Leisureland Dubai, established in 1998, has been continuously winning awards in Best Indian Food category.